Welcome to Web Authority‘s vintage Datsun 240Z, 260Z, and 280Z & 280ZX ad and print media museum, the web’s largest collection of Datsun Z-car print memorabilia. Our resident Datsun fans have spent years compiling an archive of more than 30 authentic classic Datsun Z-car ads, which we have published here for you. For our main vintage Datsun archives, click here. Note: This is a satellite page. If you are looking for the main vintage and classic Datsun archive page click here. If you are looking for the vintage Datsun pickup trucks/racing/miscellaneous page, click here. 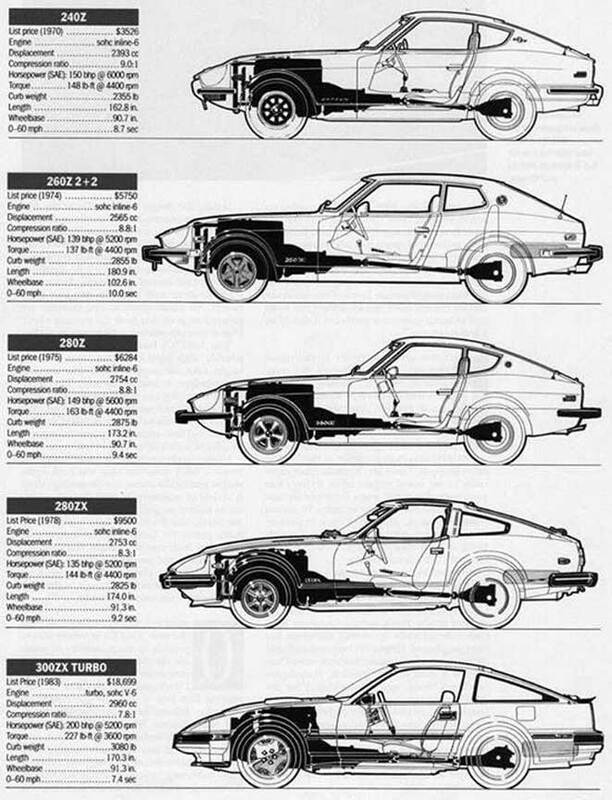 Specifications sheet of various Datsun Z-car generations 240Z, 260Z, 280Z, 280ZX, 300ZX Turbo. Datsun 240z classic cutaway illustation by Shin Yoshikawa. Datsun 240-Z classic ad “Datsun introduces a new kind of economy car… the 240-Z” with full Datsun lineup on bottom of page. Datsun Fairlady 240ZG art illustration graphic. Datsun 240-Z classic ad press photos media kit.